Driving the long passage back out from the Cape we saw so many buses and cars driving to Cape Reinga and Ninety Mile Beach that we lost count. All rushing to get up there and back on day trips. It is so touristy in Northland that it has lost a lot of its charm. While at Cape Reinga Lighthouse we noticed the new multi-destination sign post which looks rather tacky and tinny compared to the bright yellow wooden AA signs previously positioned there. However, we moved on down the Peninsula turning east at Awanui to check out the Pacific Bays of Northland and to continue towards our ultimate destination for today - Paihia in the Bay of Islands. First up was the Karikari Peninsula with its pristine beaches such as at Maitai Bay a beautiful tropical looking beach great for swimming, snorkelling and sunbathing. 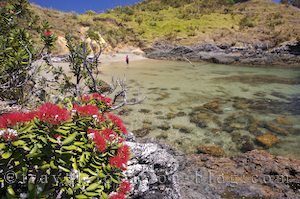 We found a private bay separated from the main sandy beach and a few native Puhutakawa trees (New Zealand Christmas tree) which made a pretty foreground for pictures, then enjoyed a walk along the beach. Next up was the small fishing town of Mangonui where we enjoyed some of the best fish n chips in the country! No visit to Northland would be complete without a stop off at the historic Stone Store built in 1835 in the orange growing region of Kerikeri. The Stone Store is considered one of the oldest buildings in New Zealand. We pulled into the hectic tourist town of Paihia in the early evening and checked out the goings-on while enjoying a double ice-cream each. Later we found an acceptably priced campsite - a different take on freedom camping?! Each site costs $15.00 per night per camper but this is only suitable for completely self-contained campers with no need of facilities such as showers and toilets. Still a hefty price considering the lack of facilities but still better than paying $35.00 a night anywhere else (although for $35.00 you do get the facilities). Gone are the days of true wilderness camping! !